The pumpkin spice craze comes in hot during the cool, fall months, and every year it seems to creep back in way earlier than the official start date to autumn. From lattes to pies to pumpkin-flavored beer and cocktails, you have to be careful not to let this limited edition, seasonal flavor pack on too many calories this fall. Pumpkin spice, which includes nutmeg, cinnamon, ginger, allspice, and cloves, isn’t necessarily unhealthy on its own with just 19 calories per tablespoon (plus, it’s not like anyone’s eating this spice solo), but since most of its uses are in sweet, indulgent treats, it might not be the best option for those of us trying to power through our health kick as the holidays approach. 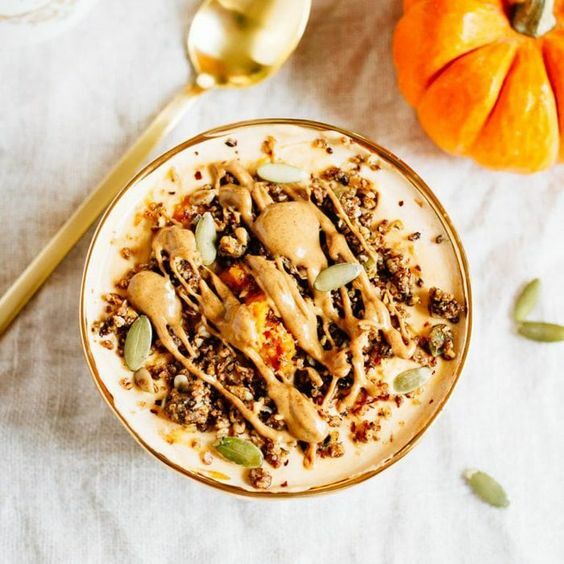 But that doesn’t mean you can’t get in the cozy, fall spirit at all, and in fact you can still eat and drink pumpkin spice all season long with these healthy alternatives. Plus, it’s calorie free to burn a pumpkin-scented candle in the house when you’re cooking up some of these sweet recipes --right? While a 12-oz. pumpkin beer could cost you 200 calories or more (and let’s face it, you’d probably want to have more than one), enjoying a bourbon drink with a splash of pumpkin flavor is going to go down just as smooth and for half the amount of calories. 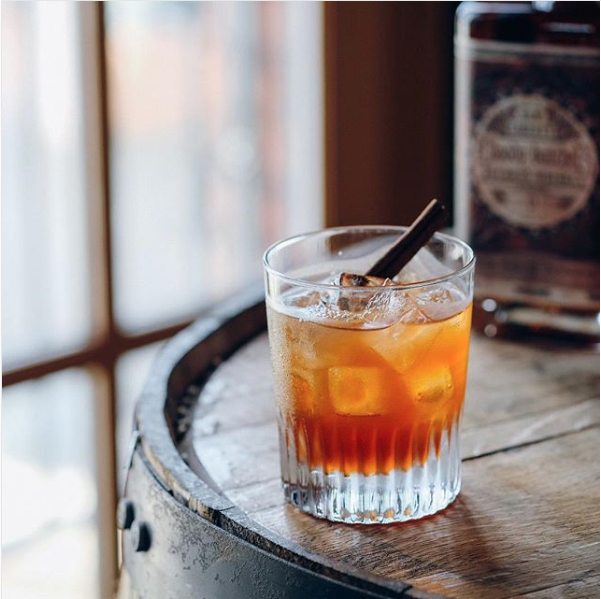 Whiskey is a surprisingly low calorie liquor, and this recipe from New Liberty Distillery only requires one extra ingredient to make it fit with the spice of the season --an ounce of pumpkin-flavored simple syrup. In this protein-packed recipe from the Eating Bird Food blog, you can create the base of this bowl by using a plain or vanilla flavored Greek yogurt, or dairy-free yogurt like almond milk yogurt. Or, if you’re looking for as much pumpkin as you can get, pick up a pumpkin-flavored yogurt from the tried-and-true health conscious brands like Chobani. From there, you’ll add pumpkin seeds or fresh granola for an extra crunch, a bit of pumpkin puree for added flavor, and as many dashes of cinnamon and pumpkin pie spice as your heart desires. And, if you dress this bowl up appropriately, it’s going to make for an Instagram pic that will make your followers even bigger fans of fall. Siggi’s products are great on its own, but when its ingredients are combined to make a pumpkin spice pancake breakfast that clocks in at just 390 calories per serving (AKA for three pancakes), it makes the most important meal of the day taste even sweeter. By combining egg whites and yogurt and adding it into the flour mixture, these pancakes don’t need much to become a fall staple at the breakfast table --especially when topped off with a little bit of maple syrup, another fall favorite. You’ll get a taste of pumpkin pie in every bite while enjoying one of the most indulgent breakfast foods guilt-free. Energy bites are one of the easiest snack recipes ever, and all you have to do to jazz up your current energy bite recipe for fall is to add a little bit of that seasonal, pumpkin flare. Seriously, these sweet, protein-packed treats really are that easy --this 10-minute recipe from Gimme Some Oven is calling your sweet tooth as soon as you start reading the ingredients. Energy bites, which are oat-based, are perfectly complemented by seeds, spices, dried fruit and of course some sweet, organic honey to make it all stick together and form into these nutrient-filled balls. It’s a little bit of pumpkin puree and ginger, nutmeg and cinnamon that’ll give these no-bake energy bites the true taste of fall. No matter how disciplined you are, it would be pretty tough to avoid the seasonal menu at Starbucks all autumn long. And not only does the coffee conglomerate have the famous Pumpkin Spice Latte (PSL) as its fall claim to fame, they also display a wide array of menu items like the Salted Caramel Mocha Frappuccino that are more than likely not the healthiest drink option. But hey, it’s OK to treat yourself sometimes to a seasonal drink that makes you feel all warm and fuzzy inside, but be smart about your order and spend a few extra seconds customizing your order with the barista. By replacing regular milk with almond milk, coconut milk or nonfat milk in your favorite fall beverage, you can save yourself some calories without compromising on the sweetness. And if you want to save yourself the calories and the extra cash you’ll spend by going to the drive-thru, you can make a pumpkin spice latte at home (it’s a lot of work, but it’s worth it) or take the easy route and add a little sugar free pumpkin spice creamer to your coffee. How can something so creamy be dairy free and vegan? It seems too good to be true, but according to Cookie and Kate’s creamy roasted pumpkin soup recipe using real roasted pumpkins, this soup is the real deal. Other than grabbing a pumpkin for this recipe, most of its ingredients can be found right in your kitchen cabinets like vegetable broth, black pepper, cinnamon, nutmeg, olive oil and sea salt. In just 15 minutes of prep time and a little over an hour of cooking, you’ll have yourself an entire meal that smells and tastes like a cool, autumn day. Though dark in color, rum is another surprisingly low calorie liquor that you’ll hardly be able to taste amongst all the flavors in this bright, flavorful pumpkin pineapple and rum cocktail. You can skip the thick, creamy filled pumpkin drinks with Bailey’s or whipped cream and replace it with this drink that mixes produce like lemon with pumpkin puree, maple syrup, a few dashes of your favorite fall spices, and of course pineapple juice. This cocktail is perfect if you’re not quite ready to let go of summer yet and are hesitant to embrace the pumpkin craze (but secretly you know you want to).